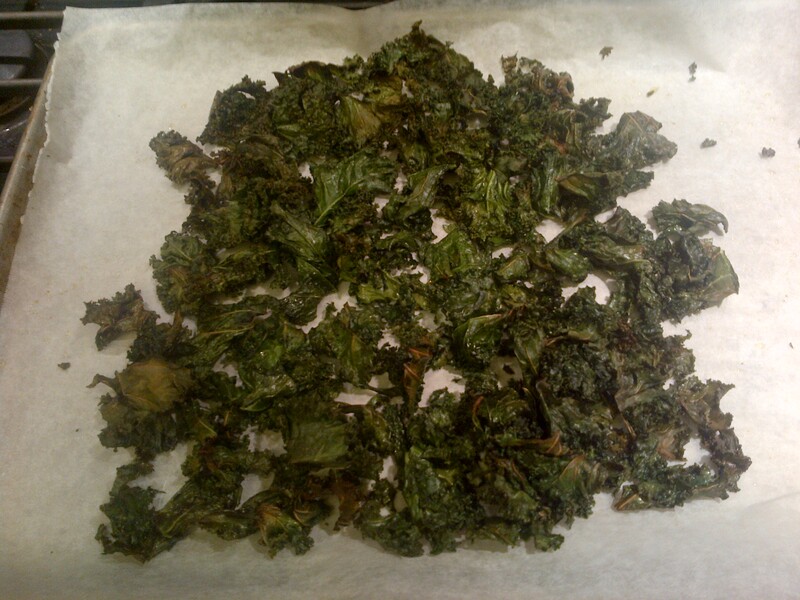 With my refrigerator practically bursting with winter greens from my CSA farm shares, I decided to use up a bunch of kale by making kale chips. My kids and I devoured these so quickly I wished we had even more kale! Try these as an alternative to potato chips. Preheat the oven to 350 degrees Fahrenheit. Wash and dry the kale thoroughly. Remove the center rib from each kale leaf with a kitchen knife, scissors, or by tearing. Tear or cut each leaf into bite-sized pieces. 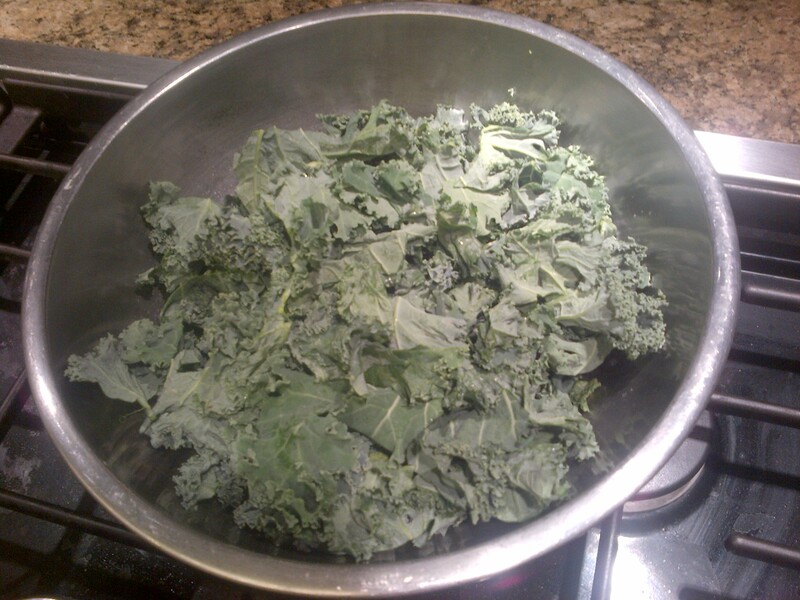 Raw kale, ready for a sprinkle of olive oil and salt. Toss the kale with the olive oil and salt (tip: it’s best to add the least amount of olive oil necessary to coat the kale — any more than that and the kale leaves will remain soggy rather than become crispy). 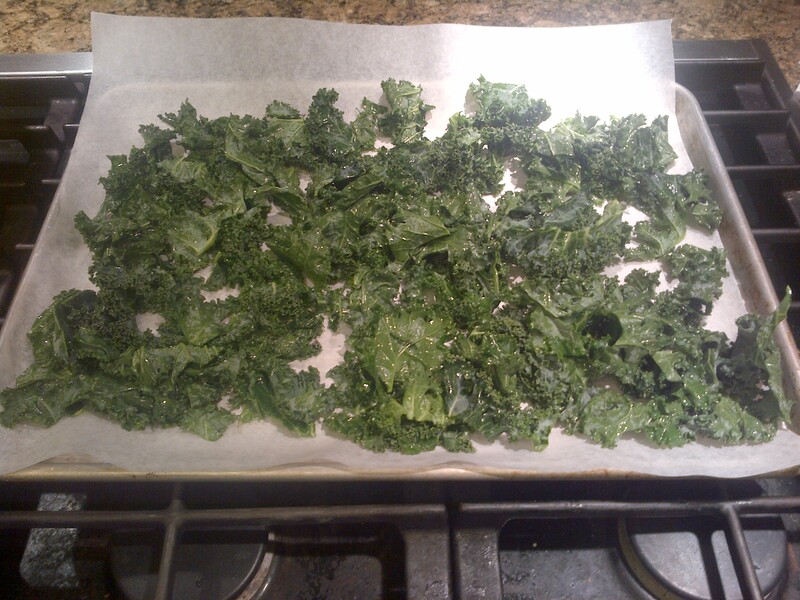 Line a cookie sheet with parchment paper (if available) and spread the kale evenly over the sheet. Glistening with garlic-infused olive oil and salt. Bake for 10-15 minutes, watching carefully in the last minutes to remove the chips as soon as they are just browning at the edges. You can use tongs to toss the kale chips halfway through cooking. If you remove the chips as they begin to brown, they will be crispy but not crumbly. Goodbye beautiful baked kale chips. Prepare to be gobbled up in seconds! Have fun with this recipe and experiment with the flavorings. Some people use seasoned salt. Others like to coat the kale with soy sauce or vinegar instead of olive oil. Have you ever made baked kale chips? What’s your favorite way to season them?